The uglification of the American landscape has been far from comprehensive. When I visited my parents in New Jersey for the holidays, I brought my camera and drove down U.S. Route 22 to take some pictures. Route 22, which traverses New Jersey east-west from Pennsylvania to Newark Airport, is one of the state’s most heavily retailed corridors and one of its first major post-war highway strips, in other words a four-lane highway cluttered by fast food, big box stores, plazas, motels—everything imaginable. 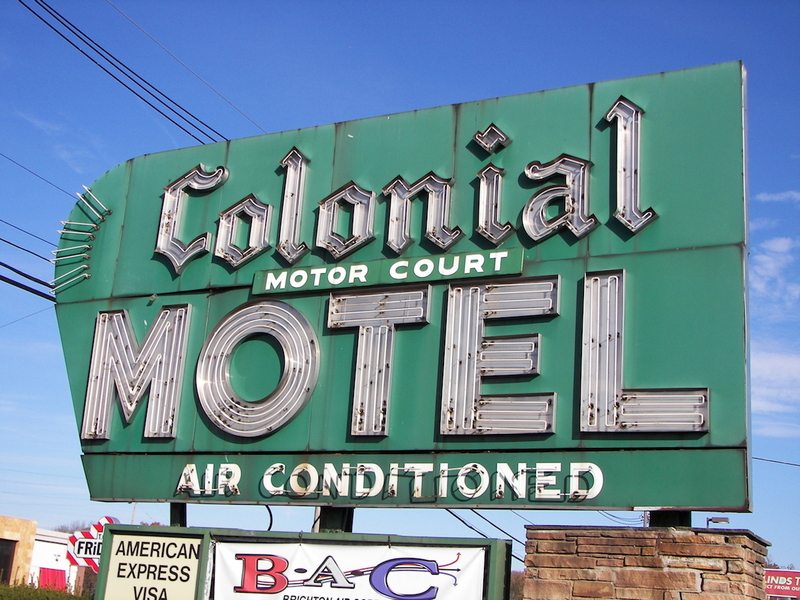 This stretch, like many others in New Jersey—the Lawrenceville/Princeton Route 1 strip and Route 10 in East Hanover come to mind—was once a motel-and-diner route that was bypassed but not killed by the Interstate. Some of the original build-out, both architecture and signage, still remains, albeit largely transformed and repurposed. 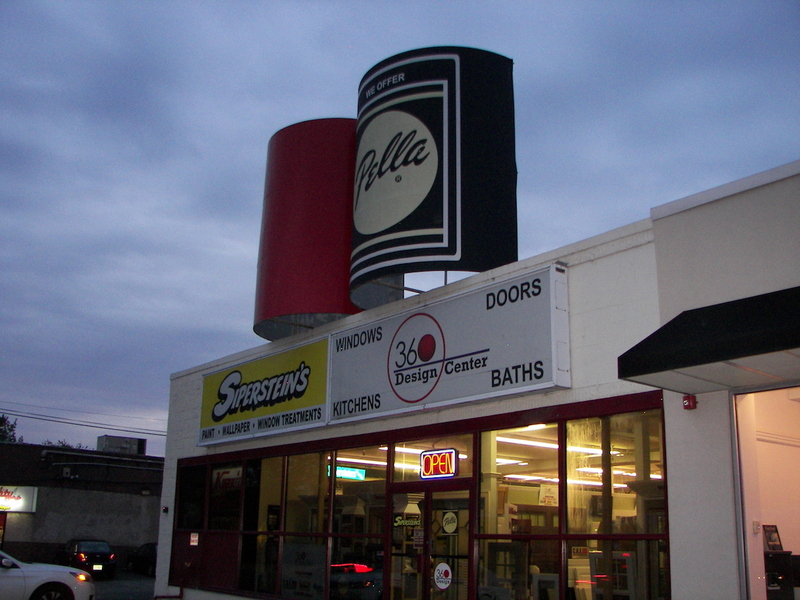 As a child, a drive down Route 22 meant a family shopping trip. As recently as the early 2000s, it included such vanished outposts as Sports Authority, Sixth Avenue Electronics, The Wiz, and many others for which, in our dizzying economy, there’s little evidence left of their erstwhile existences. I can’t say why this old strip in particular interested me so much, but in addition to taking photographs I also did some reading about some of the shopping centers there, trying to figure out their retail history. 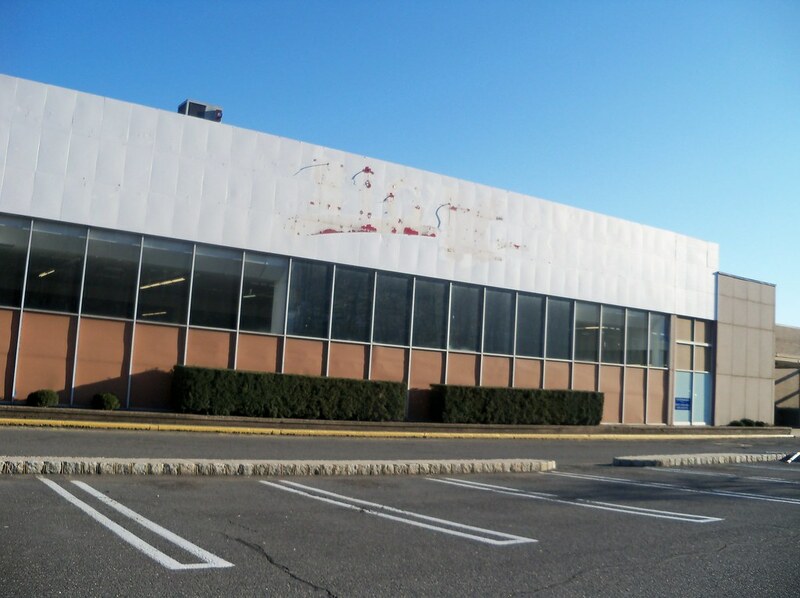 One of the first along Route 22, built in the mid-1950s, included a large discount department store: first the long-vanished Great Eastern and Valley Fair chains, and eventually a K-Mart and Pathmark, also now closed. 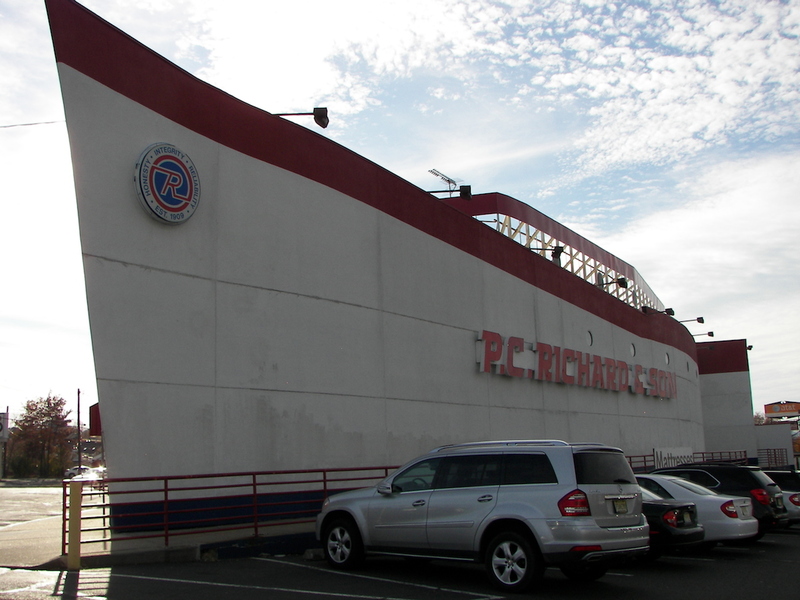 A few years ago, before the vacant space was razed and replaced with a Costco, nearly the whole center sat empty. The real estate holder for the center is a company called Vornado Realty Trust. Vornado was a midcentury appliance maker that was purchased by Two Guys, a New Jersey-based discount store chain with locations along Route 22. Two Guys, before going defunct in the ’80s, branched out into the real estate business, using the Vornado name (which was later licensed to the company currently making Vornado-branded fans). The short of this is that a little, odd remnant of a midcentury discount department store still remains in that dead, and now revived mall. This anecdote has something to teach us, reinforced by observing countless other shopping centers and even whole development patterns: Our basic modes of living have remained basically unchanged over the decades. It is very easy to absorb by osmosis the pseudo-theology of progress that animates much American thought—the hazy idea that God wants us to live in ever-larger single-family McMansions and drive two SUVs in ever-longer commutes out from the exurbs, along with its corollary that this upward progress represents a large and desirable break with the past. One could easily think that America’s true rulers are prosperity gospel preachers and the Jetsons. One could easily think that America’s true rulers are prosperity gospel preachers and the Jetsons. Yet while the cosmetics of cars and buildings might evolve, and the suburbs might inch their way out into the farms, not much has really changed since at least 1950. 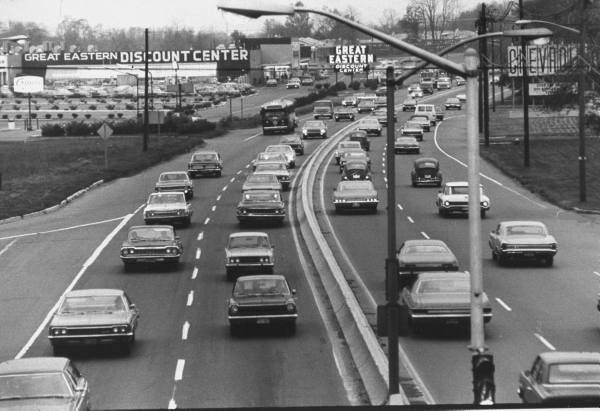 Costco and Great Eastern are not the same store, but both are discount department stores that have occupied the same piece of land on the same road for nearly 70 years. Go several decades back, long before the neon and the chrome, and Route 22 is still there. Historic imagery shows a gradual build-up, not an explosion. The change is real, but it is gradual and path-dependent. Look at the historic satellite imagery on Google Earth or historic aerial photos, and you’ll see that “development” quite often means “a little more of what we already have.” Satellite maps, like ruins, are a good antidote to delusions of grandeur. Everything we have built is just a swatch of gray in a sea of green. Our mighty highways are thin lines, mere impressions in nature. The change is real, but it is gradual and path-dependent. There are plenty of real towns behind and between the “retail corridors” of strip malls and chain restaurants. There are, of course, plenty of real towns behind and between the “retail corridors” of strip malls and chain restaurants. It is true that the coveted several miles of highway frontage that each distinct municipality on the route claims are a major source of revenue and jobs. Most articles about the economy of North Plainfield, for example, center around projects along the North Plainfield stretch of the Route 22 strip. Yet these strips display little of the character, human interest, and diversity that off-highway places do. For example, mostly absent on the strip are niche or ethnic businesses, which have more trouble affording the high rents. Within a couple of miles of Route 22 are a Polish deli with an excellent homemade $6 lunch special, a German grocery shop selling locally produced kielbasa and smoked meats, and a small butcher. Along the nearby highway itself are a stranded motel sign—the motel has been torn down—and large centers featuring Target, Walmart, and Best Buy. Driving these strips can feel uncannily like running somewhere inThe Flintstones. Peruse the Google Maps satellite view overlaid with state and Interstate highways, and you’ll notice that there are large areas that have no state highway frontage at all, and that are nowhere near an Interstate exit. Geographic space is not linear, of course, so this should not be surprising. Yet it is easy to forget that the major highway strips cover only a small slice of the given land area. Some of this “stranded” area consists of vast tracts of cul-de-sac developments with an occasional fossilized, semi-engulfed main street, the kind of place where a half-gallon of milk requires a 15-minute drive. But much of it is forest or farms, where a surprising number of people still seem to subsist on the land in some manner. When I drive along the backroads of New Jersey or Virginia, I see plenty of small homes and fields with tractors, aging cars, stacks of firewood, and horses and cows. One can almost imagine that this is real land, lived on, worked on, and passed down, and that the Interstate and the mall build-up and now the retail apocalypse and even the financial crisis mean nothing here. It is not that simple, but it at least means the uglification of the American landscape has been far from comprehensive. One knows this from the fact that many American backroads, even in 2018, have no Street View imagery in Google Maps. Still, I did not drive around small towns and farm country to take pictures of a fading way of life. I took pictures of fading suburbia. It is possible to recognize, at a high level, that suburbia and sprawl are faulty modes of development, and still feel nostalgia for them and chronicle their history. The suburbs are old enough to have developed their own history and culture—human realities that can be appreciated and coexist with another reality: that, ideally, there might be no suburbs at all. Addison Del Mastro is the Assistant Editor at The American Conservative, and writes frequently for TAC and other publications on culture, popular history, urbanism. He tweets at @ad_mastro. This article originally appeared in The American Conservative.